When TheatreStorm founder and editor, Charles Kruger, lost a job as a high school English teacher back in 2009 at the age of 53, he was moved to reevaluate his life. After much reflection, he decided not to seek work as a teacher and instead devoted time to the “storming bohemia” project. This project consisted of a commitment to attend 90 literary events in 90 days, and document the experience in a blog. His goal was to reinvent himself artistically and see if he could rediscover an artist’s identity which had gone somewhat fallow for a number of years. The project succeeded beyond his wildest dreams. As “The Storming Bohemian,” Charles has become a well-known figure in the San Francisco literary, artistic, and theatre communities. His blog attracted enough attention to warrant a mention in the New York Times. His experience reignited his writing life, and he began to appear as a performing poet in venues throughout the Bay area andto publish work in literary magazines. Besides founding and editing TheatreStorm, he has been a contributing writer to Litseen and The Rumpus, and has served on the Boards of two well-respected Bay area reading series, Quiet Lightning and Bay Area Generations. 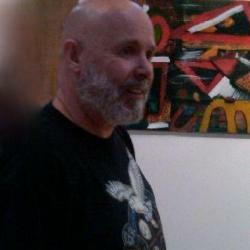 He has also taken up painting, and his work can be seen at Charles Kruger Art. He has recently moved to Vallejo, California (still part of the SF Bay area) where he hopes to contribute to the growing artistic scene. Charles is an associate voting member of the San Francisco Bay Area Theatre Critics Circle. He holds an MA in Theatre Arts from California State University, Long Beach.